BEIRUT: For two weeks, a lion cub has sat in a small cage in Beirut with dirty bedding and no natural light, nursing its swollen paws. 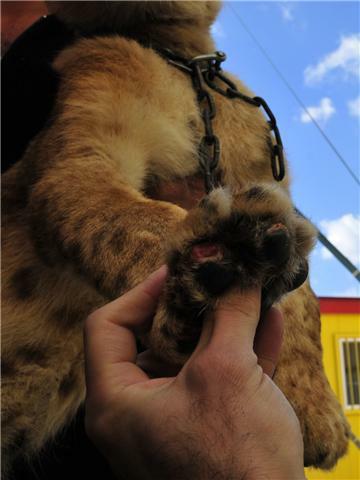 The lion cub was brought to Lebanon with five other lions, three tigers, two snakes and a number of domesticated animals to perform at the Monte Carlo Circus in the Beirut suburb of Dora. But in a rare victory on Friday, the animals’ owner was ordered to leave Lebanon within 24 hours. Lebanese Agriculture Minister Hussein al-Hajj Hassan declared the circus illegal and ordered its immediate closure after animal welfare campaigners alerted his office to the circus’s mistreatment and incorrect paperwork. “I would have preferred for the animals to be confiscated and the minister indicated that’s what he would have preferred to do, but the legal framework just isn’t there,” Jason Mier, Executive Director of Animals Lebanon told The Daily Star. Although Hajj Hassan seems keen to advance animal welfare legislation, there are very few such policies in Lebanon. Lebanon and Bahrain are the only Arab states who have not signed up to the 1975 Convention on International Trade in Endangered Species of Wild Flora and Fauna (CITES), to which 175 states are a party. While Lebanon is not a signatory to CITES, it is required to monitor any trade of animals between countries who have ratified the convention. But in this case, border officials failed to notice that the animals were “in a terrible state,” Meir said. Animals Lebanon was first alerted to their plight after the Princess Alia Foundation in Jordan raised the alarm on December 24, when it contacted the organization to say the animals were stuck at the border and hadn’t been fed or watered for days. 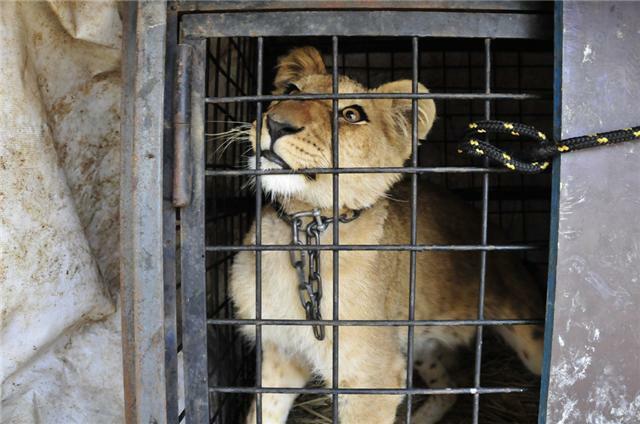 The animals spent a total of six days in transit, finally arriving in Lebanon on December 27. In addition to “serious concerns about paperwork,” Meir and veterinarians have accused Monte Carlo Circus officials of inhumane treatment of the animals. An independent vet appointed by Animals Lebanon to examine the animals wrote in a report addressed to Hajj Hassan that they were visibly neglected, dystrophic and malnourished. Only two tigers and two lions had access to water in their cages, but the quantities were insufficient and “filthy,” said Ali Hemadeh, who is also the Beirut Representative of the Lebanese Veterinary Syndicate. A second opinion also highlighted serious concerns for the animals, calling the declawing of the lion cub “barbaric.” John Knight, an independent zoo veterinarian and senior veterinary consultant to the Born Free Foundation, described the condition of the cub as “appalling” and suggested its owner “fundamentally lacks an understanding of the management” of such animals. The family of circus owner Hussein Akef, which has operated circuses for the last 100 years, has in fact been investigated in several countries over concerns for animal welfare. One such investigation in Mozambique led to the family having their animals confiscated in 2007 and re-homed. At Friday’s meeting with Hajj Hassan, Akef and his Lebanese business partner Suheil Obeid reportedly attempted to resist the minister’s ruling and “tried to use their connections” to have it overturned, Meir said. Attempts to reach both men were unsuccessful. “This shipment could have been stopped long before ever entering Lebanon, but now is the opportunity for the [Lebanese Agriculture] Ministry to make a strong statement that Lebanon will no longer be used as a hub for smuggled animals,” said a statement on the Animals Lebanon website. Although Lebanon currently allows animals to be used in circus performances, Meir said he hoped the ruling would push Lebanon to ban the practice and pursue serious legislation. In September, an abandoned lion cub was discovered in a Beirut alleyway. The starving animal, which had been kept illegally, died shortly after. Elephants and chimpanzees have also been smuggled in and out of Lebanon. Can I get permission to use the first photo for a school project? Sign me up to Gutter Poetry!